As key pillars of our corporate philosophy, sustainability and environmental protection are a top priority for us. For many years, we have taken concrete steps to move away from energy and resource-intensive production towards a gentler and more environmentally friendly approach. In doing so, we endeavour to ensure transparency and credibility at all times. That applies to ourselves and to all the partners and suppliers that contribute to our environmental protection measures. Our customers can therefore be sure that they are receiving print products and media services that meet the highest quality and ecological standards, which in turn has benefits for their own business and image. We are totally committed to protecting the environment. Because we are totally committed to sustainable environmental protection, we don’t just make superficial gestures – we get to the very roots of issues with a range of practical measures. For a number of years now, we have been committed to systematically protecting the environment and using sustainable and effective solutions that far exceed normal standards. Having a permanent environmental management system in place in all areas of our Group that features emission-saving projects and far-reaching energy efficiency measures certainly isn’t something every company can lay claim to. For us, however, it is crucial to our commitment to sustainability and to our firm belief that environmental protection and cost-effectiveness are two sides of the same coin. We prefer to work with FSC papers made from wood pulp sourced from sustainably managed forests, and are ourselves an FSC-certified company. The FSC seal guarantees compliance with high international ecological and social standards – so that forests remain intact for future generations. Displaying the FSC logo on your print products is a credible means of documenting how you are helping to protect forests. We are certified for climate-neutral printing. In line with our motto “avoid, reduce, offset”, we are lowering our CO2 emissions to the absolute minimum. The residual emissions are compensated for by purchasing and then cancelling legally binding, high-quality CO2 emission reduction certificates. Only using the best certificates and the highest standards ensures a real reduction in greenhouse gases and guarantees that your financial contribution is invested directly in climate protection projects. Voluntary climate protection using climate-neutral print products is a credible way to promote your company’s image. 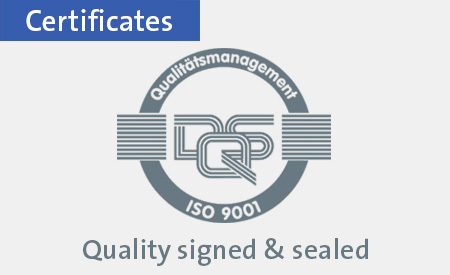 The Druckstudio Group has been certified to the internationally recognised standard for environmental management (DIN ISO 14001) since 2011.This certificate is the globally recognised documentation that confirms a company’s active and successful commitment to environmental protection with a focus on ongoing improvement, reducing environmental impact and ensuring legal compliance. 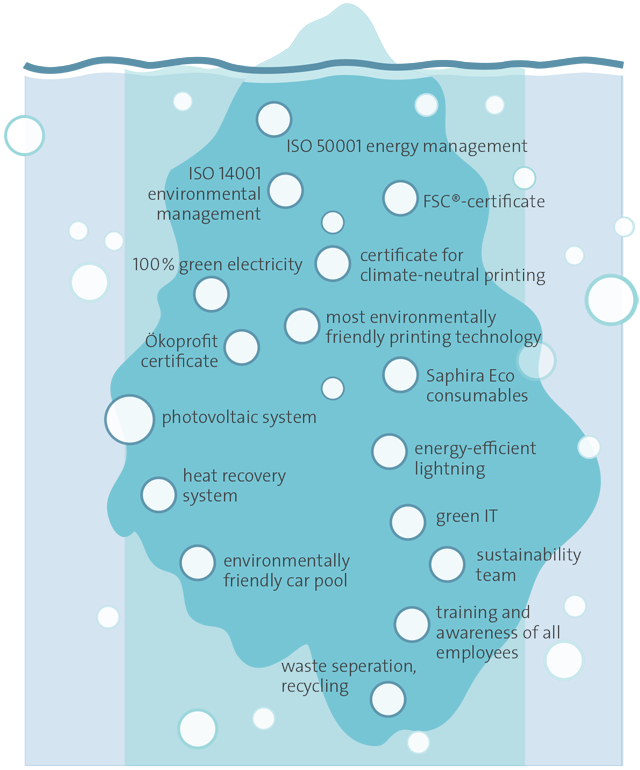 The Druckstudio Group’s ISO 14001 certification shows customers, partners and the interested public that the company is environmentally responsible, minimises its environmental impact and organises its activities accordingly. Die Druckstudio Gruppe ist seit 2011 nach der international anerkannten Norm für Energiemanagement (DIN ISO 50001) zertifiziert. This certification confirms our responsible use of valuable resources. The overall objective of ISO 50001 is to support organisations in building up a comprehensive energy management system and continuing to improve energy efficiency. In compliance with legal requirements, all energy issues are identified and analysed, energy flows are made transparent, costs are cut and greenhouse gas emissions are reduced. ISO 50001 helps pursue energy targets in a systematic, comprehensive, targeted, organised and sustainable way. We meet 100% of our energy needs with green electricity, underlining our commitment to environmentally friendly energy. BusinessStrom Green direkt means highly eco-friendly and completely CO2-free renewable energy generated by Austrian hydropower plants. Stadtwerke Düsseldorf source green electricity directly from a certified plant operator, thus ensuring clear traceability. The use of consumables such as printing plates, inks, coatings, adhesives, washing fluids and dampening solutions makes up a significant part of a print shop’s environmental footprint. In all areas of production, from pre-media and printing right through to postpress, we use Saphira Eco consumables from Heidelberg, a range that meets the most stringent environmental criteria in the print media industry. These products conserve resources, ensure consistent quality, and reduce emissions. As the world’s first print shop to switch over to the Saphira Eco range, we meet and even exceed some of the highest industry standards and legal requirements – without ever compromising on print quality. In 2009, we took part in the state of North Rhine-Westphalia’s Ökoprofit environmental project and were officially certified as an “Ökoprofit company” in January 2010. As part of this project, we continue to review various ways of further reducing our consumption of resources and energy. For instance, as a result of installing a heat recovery system for our presses, we no longer require a single litre of fuel oil to heat our offices and production halls. We have also installed a photovoltaic system on our roofs and switched to green electricity. Our well-documented and certified commitment to environmental protection and sustainability also helps our customers boost their credibility. Following extensive research, Stiftung Deutscher Nachhaltigkeitspreis e.V. (German Sustainability Awards foundation) has selected us as a project partner for printing – and it has done so because of our sustainable corporate strategy. Our commitment has seen us providing advice and support to the foundation in organizing German Sustainability Day since 2009, with print products, practical contributions and involvement in theme-based forums as part of discussion sessions. Each year, around 2,000 participants from business, politics, the media, research and civil society attend Germany’s leading conference on sustainable development and the evening awards ceremony. During the day, high-profile speakers and renowned experts present their positions on various aspects of CSR and sustainability. In the evening, the competition winners receive their awards at a gala event. Our environmental achievements have also won several awards and been nominated for others. At the high-profile Druck&Medien Awards in 2012, we were declared “the most eco-friendly print shop in Germany”. The year before, we were shortlisted for the Heidelberg ECO Printing Award 2011 in the “Sustainable companies” category. This put us among the most sustainable print shops in the world. These nominations, together with a range of earlier awards from independent international and national bodies, show that the issue of sustainability, in terms of ecology, economy and social commitment, isn’t just a passing trend for us – it is a principle we have been actively upholding for many years. At the same time, these awards motivate us to keep on improving our environmental management and continue to invest in new environmentally friendly technology.